This page will be used to pass information related to Hurricane Irma. Updates will be posted in chronological order. CSA Hurricane Hotline 1-866-671-3822 (EVAC) This phone line will play a recorded message with pertinent updates. Communications from CSA should be secondary to the messages passed from government officials via local TV, radio and emergency management websites. Please monitor local radio and television stations and follow the instructions of emergency officials. The Town of Hilton Head continues their beach fill project along the Sea Pines beach following damages from Hurricane Matthew and Tropical Storm Irma. The active work zone is currently located between beach marker 20, 21 & 22. Work is moving northwards towards East Beach Lagoon. This work zone location (Markers # 20-22) between 16 Marsh Wren Road and 18 Grey Widgeon Road are currently restricted due to beach renourishment construction. It’s important to note that the area within the work zone is completely closed from the ocean to the dunes (i.e. you can’t walk around it). Property owners, guest and visitors are asked to please not enter or attempt to cross through the active work zones as they are restricted. Please also do not attempt to directly contact machine operators. Please refrain from using the above listed beachwalks and boardwalks until further notice. The Sea Pines Forest Preserve and Six Oaks Cemetery have re-opened. Property owners, guest and visitors are asked to please use caution using roadways, pathways/ leisure trails and common locations in these areas. Some areas in the Sea Pines Forest Preserve may still be restricted due to damages, these areas will be marked. CSA’s Debris Recycling Facility has re-opened to property owners and landscape contractors from 7:30 am to 4:00 pm, Monday through Friday. This facility will remain closed on holidays and weekends. The CSA Debris Recycling Facility can only accepting the following vegetative materials: palm fronds, leaves, sticks, branches and vegetative debris (Trees or branches must be under 6″ in diameter). We do not have the ability to process material 6″ and above. The dumping of paper, plastic, metal, concrete, sand, dirt, clay, building materials or food waste are strictly prohibited in the CSA Debris Recycling Facility, violators may be cited. For questions related to the CSA’s Debris Recycling Facility please contact our maintenance department at 843-671-7849 or at csamaintenance@csaseapines.com" target="_blank" rel="noopener">csamaintenance@csaseapines.com. Effective Monday September 18, 2017 CSA has begun servicing our neighborhood debris drop off sites following the storm. These drop off sites are for Sea Pines Property Owners only and are to be used for debris that you the property owner collect from their Sea Pines private property. Palm fronds, leaves, sticks, branches and vegetative debris (Trees or branches must be under 6 inches in diameter). Please note CSA does not have the ability to process material 6 inches and above. The dumping of paper, plastic, metal, concrete, building materials, vegetative wood materials 6 inches and above or food waste are strictly prohibited. Commercial landscapers are NOT permitted to dump landscaping debris in the neighborhood drop sites or roadside within Sea Pines. Commercial landscapers must take the debris collected from Sea Pines property owner homes to the CSA Debris Recycling facility located off of Greenwood Drive near the main trolley lot. This location is open between the hours of 7:30 am to 4:00 pm, Monday through Friday. There are penalties in place for contractors caught dumping debris roadside or dumping in designated neighborhood drop sites. If you observe a Commercial Landscaper dumping in these neighborhood drop sites, please contact Sea Pines Security at 843.671.7170 and provide the company name and a description of the vehicle. Work along Plantation Drive began at the intersection of Lighthouse Road and work will proceed towards Greenwood Drive. Motorist may still access Plantation Drive during this project, but should expect traffic delays. Flagmen will be present during the project and there will be intermittent lane closures. Crews will work Monday to Thursday 7 am – 7 pm and Friday 7 am- 4 pm. No work shall take place on observed holidays. This area is considered an active work zone, please use caution while in driving in this area. Thank you for patience as we make these necessary infrastructure and safety improvements to Plantation Drive. Prior to Hurricane Irma, The Town of Hilton Head was progressing well with their beach fill project in Sea Pines. This project was being performed to correct issues caused to select areas of our Sea Pines beach due to Hurricane Matthew. The project was temporarily put on hold due to the expected landfall of Hurricane Irma. Now that Hurricane Irma has passed a new set of issues has been created in the same area. Hurricane Irma caused a significant amount of damage to the beach in Sea Pines. The Town of Hilton Head has agreed to resume the project once again effective immediately, and here are the basic details of the project as we understand it. The Town will first work under their existing permits to restore the planned area to the levels previously planned, with some additions. The project footprint currently remains the same (Tower Beach to East Beach Lagoon), but further analysis is being conducted that may change the footprint. Work will begin at Green Wing Teal and will proceed northwards towards East Beach Lagoon. It is expected that this area will be completed by mid-October. Debris removal by contractors began yesterday 9/14/17. No work, including temporary repairs, should be made to any boardwalks at this time. Property owners should not move debris to the impacted beach area, current conditions have been documented by the Town. The dredge used to complete this work has re-mobilized and is currently back in the area and shore dredge pipe will be moved starting today 9/15/17. Dredging will commence tomorrow Saturday 9/16/17 (please note crews will be working 24 hours a day). Property owners, guest and visitors are asked to please not enter active work zones or attempt to directly contact machine operators. This is an active and fluid emergency action caused by Irma. We will do what we can to keep you informed, but things may change without notice. We appreciate your cooperation and support while this important work is being performed! Due to the effects caused by Hurricane Irma, effective today September 15th, 2017, CSA is temporarily permitting property owners who sustained damages to their property to call in gate passes for their commercial contractors for a 30 day period. Property owners in this situation are asked to please contact the Sea Pines Gate Pass office by calling 843-671-7277. Our staff will ask you for the contractors business name and confirm the length of the work. Please note we can issue these temporary passes for a 30 day period only. We hope this temporary modification in our gate pass issuance will better assist in recovery efforts for our property owners. Please contact the Sea Pines Gate Pass office at 843-671-7277 with questions regarding this temporary change. The CSA Maintenance Department has several contractors working in CSA managed areas performing hazardous tree removal and tree pruning as needed to trees damaged from Hurricane Irma. To report a leaning or downed tree that is located on CSA managed property, please contact the CSA Maintenance Department. The CSA Maintenance Department continues work to clear clogged storm drains and culverts throughout entire Sea Pines community following Hurricane Irma. We have nearly 3,000 storm drains in total in Sea Pines. Property owners are asked not to blow debris or landscaping materials into the storm drains as this could further block the drainage system. Following Hurricane Irma, CSA cleared a large 42″ diameter drainage pipe in the South Beach area that became partially obstructed with storm debris, we mobilized a specialized contractor with a high pressure jetting machine to clear the debris and a scuba diver was also mobilized to visually inspect the line to ensure it was flowing properly. We also executed drainage pipe clearing and jetting on Calibogue Cay Road. Our landscaping contractor, Ocean Woods Landscaping along with CSA Maintenance Staff are working diligently to restore our landscaped areas. Please be patient with our landscaping services as we deal with saturated ground conditions, which could cause delays in the restoration process. CSA continues to clear debris from our leisure trails and bike paths following Hurricane Irma. Please use caution using roads, pathways and common areas. Be mindful of danger from above in the form of falling debris/limbs. To report an issue on these pathways, please contact our maintenance department. CSA will resume our mosquito spraying operations following Hurricane Irma tonight (Thursday 9/14/17). Next week, we will be back on our regular schedule. Please understand, the CSA Debris Recycling Facility will only be accepting the following vegetative materials: palm fronds, leaves, sticks, branches and vegetative debris (Trees or branches must be under 6″ in diameter). We do not have the ability to process material 6″ and above. The dumping of paper, plastic, metal, concrete, sand, dirt, clay, building materials or food waste are strictly prohibited in the CSA Debris Recycling Facility, violators may be cited. Please adhere to this policy as CSA Staff will be monitoring the entrances and checking vehicles for compliance. If contractors are found non-compliant they will be turned around and restricted from dumping vegetative debris at the CSA Debris Recycling Facility. Thank you for your cooperation. Effective Monday September 18, 2017 CSA will once again begin servicing our neighborhood debris drop off sites following Hurricane Irma. These drop off sites are for Sea Pines Property Owners only and are to be used for debris that you the property owner collect from their Sea Pines private property. The following boardwalks/ beachwalks sustained damage from Hurricane Irma and are temporarily closed. CSA is working with a contractor to make temporary repairs where possible. Crews will work on Saturday September 16 to make up a day in order to stay on schedule following Hurricane Irma. The following beachwalk access paths are temporally flooded, preventing access. We will notify the community once they are re-opened. Due to the effects caused by Hurricane Irma some property owners have requested permission to place a Portable On Demand Storage container, box type trailer or similar storage container on their private property. Through an agreement with and permission from CSA, property owners may place the POD like container on their private property for up to a 60 day period. Property owners requesting this permission are asked to come into the CSA Administration Building M-F from 7:30 am-4:30 pm to complete the agreement form and receive the necessary permits. Please note, your property will be inspected and the location of the POD like container placement will be at the discretion of the ARB representative. CSA’s Debris Recycling Facility has re-opened to property owners and landscape contractors from 7:00 am to 4:00 pm, Monday through Friday. This facility will remain closed on holidays and weekends. Commercial landscapers must take the debris collected from Sea Pines property owner homes to the CSA Debris Recycling facility located off of Greenwood Drive near the main trolley lot. This location is open between the hours of 7:30 am to 4:00 pm, Monday through Friday. The Sea Pines ARB office has resumed normal hours of operations. They are open Monday-Friday from 8:00AM-4:00PM. To contact the ARB, call 843-671-5533 or email Ken Rabon at kenr@csaseapines.com" target="_blank" rel="noopener">kenr@csaseapines.com or Suzanne Sherman at suz@csaseapines.com" target="_blank" rel="noopener">suz@csaseapines.com. If you have question regarding this project, please contact the CSA Maintenance Department at 843.671.7849 or email csamaintenance@csaseapines.com" target="_blank" rel="noopener">csamaintenance@csaseapines.com. Thank you for patience as we make these necessary infrastructure and safety improvements to Plantation Drive. Open Monday-Friday from 7:30 AM-4:30 PM. I would like to provide a few storm recovery updates for your information. First, most streets in Sea Pines are now relatively clear of standing water and passable at this time. A few streets in the South Beach including South Sea Pines Drive remain flooded, but have improved. The primary stormwater drainage pipe for that area is completely obstructed. CSA has crews working to clear the pipe and will keep you posted at to its status. Our landscape contractor, Ocean Woods, was back on site today with limited staff blowing off roadways and clearing large debris. We anticipate they will be back to full strength tomorrow as their staff continues to return home today. They will start mowing and mulching debris as soon as they get to full manpower. The Beach is another matter. The surge and sustained wave action driven by tropical storm and hurricane force winds have left the beach at least as bad as Matthew, in many areas the destruction is worse. David Henderson, CSA Director of Special Projects and Operations performed a visual inspection of our beach early this morning and is working with Town staff on possible actions. Fortunately, the Towns beach fill project contractor is already scheduled to resume their Matthew restoration beach fill project as soon as they can re-mobilize. We understand the Town is asking the contractor if they can provide additional equipment and resources. More to come on this topic soon! Below you will find many additional announcements and resources. We will continue our efforts to return Sea Pines to its pre-storm conditions and services as soon as possible. The CSA Admin office can be reached by calling 843-671-1343. Please know that we are receiving a high influx of calls at this time, please be patient with our staff. Sea Pines Security has resumed normal operations and our dispatch office can be reached by calling 843-671-7170. Beginning tomorrow 9/13/17 at 7:00 AM, Sea Pines gate sales operations will resume. Please contact our security office if you have questions regarding this process. To report a flooded roadway or to report a downed tree blocking the roadway, please contact Sea Pines Security. The roadways previously noted that were impassable have re-opened, however we ask that you use caution while driving on all roadways in Sea Pines. Our staff will continue to monitor roadway conditions and may close roadways as needed. The CSA Gate Pass Office has resumed normal operations and is open 7 days a week from 7:00 AM-11:00 PM. The CSA Gate Pass Office can be reached by calling 843-671-7277. Property owners may now once again call in guest passes for their guest. Property owners are reminded that gate passes cannot be called in for contractors. The daily gate fee for commercial vendors to access Sea Pines is $10 or the contractor may purchase a commercial contractor decal from CSA. The CSA Maintenance Office is open Monday-Friday from 7:30 AM-4:30 PM. To report a maintenance issue please contact us at 843-671-7849 or email us at csamaintenance@csaseapines.com" target="_blank" rel="noopener">csamaintenance@csaseapines.com. Our maintenance staff is working diligently to clear blocked drained and clear debris from CSA managed roadways. Six Oaks Cemetery has not yet been cleared of storm debris and has areas that remain flooded due to storm surge. Six Oaks is not open to the public at this time, please refrain from visiting Six Oaks Cemetery until further notice. Additional updates on CSA operations will be provided as they become available. Below is an updated list as of 11:05 AM (9/12/17) of roadways/ areas that remain impassable due to the standing flood waters. Do not attempt to drive through these roadways as they are impassable to motor vehicle traffic. This is for your safety. At this time, please note that access to the South Beach area is limited to larger vehicles/ pick up trucks as some of the roadway is flooded. Sea Pines Security has established a roadblock at Scaup Court at South Sea Pines Drive. In addition, our security staff is dealing with a high number of individuals who are coming to these closed areas to take photos or see the damages. All property owners, visitors and guest are advised to avoid these areas and please let us do our jobs safely. This is for your safety. In addition to the flooded roadways/ areas above, we ask that you also be cautious of roadways not on this list. Our staff will continue to monitor conditions and close roadways as needed. The Sea Pines Security Department is taking security calls and can be reached at 843-671-7170. To report a flooded roadway or to report a downed tree blocking the roadway, please contact Sea Pines Security. The following is a list of roadways/ areas as of 9:50 AM this morning (9/12/17) that were impassable due to the remaining flood waters. Do not attempt to drive through these roadways as they are impassable to motor vehicle traffic. This is for your safety. In addition to the flooded roadways/ areas above, we ask that you also be cautious of roadways not on this list. Our staff will continue to monitor conditions and close roadways as needed. We are working diligently with a limited amount of CSA staff to clear our catch basins. Our stormwater system was built to handle rain events, not surge flooding. For the areas with standing flood waters, there is no anticipated timeframe as to when current flood waters may recede. This morning the Governor of South Carolina and the Mayor of Hilton Head Island determined it was time to lift the mandatory evacuation order for the Island effective this morning (9/12/17) at 9:15 AM. (View the Mayor’s Information release here) Recovery efforts are underway in Sea Pines following Hurricane Irma, crews from multiple organizations are working as diligently as possible to ensure Sea Pines is safe for property owner return. We experienced high winds, heavy rain and high storm surge from Hurricane Irma throughout many areas of Sea Pines. Currently there are still trees and limbs down on the roadways and excessive amounts of debris have been pushed inland from our waterways from the storm surge throughout the community. Some areas remain without power services. Our biggest concern at this point is the standing storm surge waters that remain present in many locations throughout the community. The following is a list of roadways/ areas as of 9:50 AM this morning (9/12/17) that were impassable due to the remaining flood waters. Do not attempt to drive through these roadways as they are impassable to motor vehicle traffic. This is for your safety. In addition to the flooded roadways/ areas above, we ask that you also be cautious of roadways not on this list. Our staff will continue to monitor conditions and close roadways as needed. Some roadways have sections that may have washed away and many roads still have debris on them. We are working diligently with a limited amount of CSA staff to clear our catch basins. Our stormwater system was built to handle rain events, not surge flooding. For the areas with standing flood waters, there is no anticipated timeframe as to when current flood waters may recede. Should you choose to re-enter Sea Pines know that there are many unsafe areas. We are closing roadways that are impassable. We urge you not to return to Sea Pines at this time if you have alternative options. We also recognize that for some of you circumstances may not allow you to stay away. Our focus will be restoring services to the best of our abilities. At this point there will not be any level of service which you have become accustomed. Debris pickup will not be available for some time and may need to drastically change and at least be significantly delayed. We are currently working with a very limited staff on site, most of them are in the same position that you are in. The CSA Administration office, Sea Pines Gate Pass office, Sea Pines ARB office remain closed until further notice, until our staff can return from evacuation. We will notify you as to when these locations will re-open. The Sea Pines Security Department is taking security calls and can be reached at 843-671-7170. We ask that you be self-sufficient and we ask that you be safe, as we work to reestablish community services. Information will be sent soon regarding restrictions within Sea Pines. These restrictions may change for your safety and the safety of others. Please be safe, patient and courteous. The weather overnight had no significant additional impact on Beaufort County. The South Carolina Department of Transportation is currently inspecting roadways, bridges and causeways to ensure they are safe for the volume of traffic expected during reentry. Governor McMaster is expected to hold a press conference at 10:00 AM to address reentry to the barrier islands of Beaufort County. Sheriff P.J. Tanner will address the public immediately after the Governor. Sheriff Tanner’s press conference will be held at the Beaufort County Sheriff’s Office headquarters building, 2001 Duke Street, Beaufort in the second floor training room. The media, as well as municipal and elected officials are invited and encouraged to attend. Thank you for your patience throughout this major storm event. Sheriff Tanner’s press conference will broadcast live of the Beaufort County Sheriff’s Office Facebook page (click here to view) and the County Channel YouTube site (click here to view). View the full information release from the BCSO here. It has been less than a year since Matthew and we find ourselves once again dealing with recovery efforts from another Hurricane. Irma may not have made the direct hit that Matthew did but, her effects will be with us for some time. A very different storm than Matthew, Irma has not had the enormous wind, rain and tree impact. However, the surge impact is much more significant. This afternoon just before 1:00 p.m. CSA received the OK for our advance team to come back onto the island. Our team was ready and arrived in Sea Pines shortly after 1:00. Although we had significant debris from trees it was more consistent with a tropical storm than compared to Hurricane Matthew. The tide was very high, but most areas still had some room. Then came the surge. Most coastal, marsh and low lying areas flooded, some areas in South Beach had water at least 5 feet above their home entry. Many more garages, pools and other improvements flooded in most low areas. It was almost 3:00 p.m. before surge waters topped off and began receding. Many streets were impassable. After establishing limited gate operations, security patrols and system pump operations we began establishing warning cones for blocked roadways. Since then and up to now CSA staff has also been clearing catch basins. Our storm system was built to handle rain events, not surge flooding. Waters are receding slowly. We may have additional flooding with tonight’s high tide. If you have remained in Sea Pines or came back to your home from another island location, we are not out of the woods. Please be careful tonight and in the morning. We will check road circumstances early in the morning and try to send out notices of troubled areas that remain flooded and impassable. We understand the South Carolina Governor may lift the mandatory evacuation as early as 8:30 AM tomorrow (9/12/17) for your return. We understand many of you are anxious to return home. We will be as ready as the circumstances allow. We have many areas with power outages and of course flooded areas as I write this note. We hope most of this is corrected by morning, but we won’t fully know until tomorrow morning. Check your e-mail for updates from CSA and please continue to monitor local radio and television stations for instructions of emergency officials for information on re-entry into Hilton Head. We will do our best to keep you informed. Stay safe and be courteous. The Sea Pines Security Dispatch phone line has now been restored and our dispatchers are now taking security calls. To contact the Sea Pines Security Department, please call 843-671-7170. What a day it was! How proud all Islanders should be of their Town, including all First Responders, Emergency Operations Center personnel, the Beaufort County Sheriff’s Office, our utility providers and everyone else who assisted. We weathered an incredible tropical storm and many have sustained some flooding and other damage from the combination of rains and storm surge intersecting with high tide. Irma has all but passed now and our resources are laser-focused on helping one another repair, recover and welcome all of our Islanders home. Your Town is hard at work right now preparing for your return. The Hilton Head Hospital Emergency Room operations are in the process of being restored. The damage assessment of roadways and causeways that is currently being conducted by Beaufort County and SCDOT should be completed by Tuesday at 8:30 a.m. Utility companies and PSD’s are working to repair any outages and service interruptions. As of this writing, 8,100 Palmetto Electric customers on Hilton Head Island are without power. Your Fire Rescue is fully operational. Our goal is to be prepared to allow re-entry to the Island tomorrow upon the lifting of the evacuation order by the Governor. Once the Governor has lifted the evacuation order, and the Town has simultaneously done likewise, you will be free to cross the bridge without interruption and return to your homes and businesses. We have sustained damages, and many of our neighbors in Bluffton, Beaufort and Beaufort County have too. Let’s extend to each other compassion, encouragement and assistance. Thank you so much for your patience and support during this time. Your Town looks forward to your return. In consultation with the Governor’s office, the damage assessment of roadways and causeways that is currently being conducted by Beaufort County and SCDOT should be completed by 8:30 A.M. tomorrow morning at which time a decision regarding reentry to the evacuated barrier islands will be publicly announced. Forecasts indicate weather conditions may deteriorate again overnight and add to the flooding already present on the roadways of the Beaufort County’s five barrier islands. The curfew will be in effect tonight at 7:00 PM until 7:00 AM Tuesday morning. Areas under curfew remain the same, which are Beaufort County’s barrier islands: Hilton Head Island, Daufuskie Island, Harbour Island, Hunting Island and Fripp Island. Other areas in the County are not under curfew. We appreciate your patience as we work to assess the infrastructure in an effort to ensure your safe return to the affected barrier islands. View the BCSO information release here. Flooding is causing some roadways in Sea Pines to be impassable. We are working diligently to close roadways that are impassable. If you stayed behind in Sea Pines, you are asked to please stay off the roadways and stay indoors. Some trees and debris are down throughout the community and trees and limbs are still coming down. Please continue to monitor local radio and television stations for instructions of emergency officials for information on re-entry into Hilton Head. When can I return to Sea Pines? Sea Pines remains under a mandatory hurricane evacuation order. Road blocks are in place on 278 restricting access into Hilton Head Island. To determine when you can return Hilton Head, please call the Beaufort County Sheriff’s Office Emergency Management Department at 1-800-963-5023 to determine when and if it is safe to return to the area. When re-entering please make sure to bring either your photo ID with your local address or a utility bill with your name and Island address to re-enter the Island. This is your CSA Sea Pines Director of Communications, Amanda Sutcliffe-Jones writing to provide you with some important updates. CSA deployed our advance party from the CSA Command Center in Bluffton, SC to Sea Pines and they have safely made it to Sea Pines. This group is made up of a limited number of staff members from CSA maintenance and Sea Pines security employees who had the proper credentials to return to Hilton Head Island. Led by CSA President, Bret Martin, our Director of Safety and Security, Toby McSwain and our Director of Maintenance, Russell Fredericks, this group is just beginning to access the damages within Sea Pines and establishing a priority list. Their priority will be to assist in the clearing of roadways/ drainage systems, community areas and to begin to reestablish community services to Sea Pines. Our command center has been established in the CSA Administration Building at 175 Greenwood Drive. Sea Pines remains under a mandatory evacuation order. At this time please be advised, there are many areas of Sea Pines that are experiencing flooding. Rain continues to fall and we are still dealing with some high wind gust. Some areas in Sea Pines are without power. We are working to restore the Sea Pines Security Dispatch line (843-671-7170). Our dispatch line is still being forwarded to the CSA Hurricane Hotline (1-866-671-EVAC) until we can staff this phone line. Please contact Beaufort County Emergency Management by calling 911, to report an emergency. A mandatory curfew, per The Beaufort County Sheriff’s Department is in place for Hilton Head Island, Daufuskie Island, Harbour Island, Fripp Island & Hunting Island tonight from 7:00 PM-7:00 AM (9/11/17). An order from the Mayor’s office for re-entry onto the Island will not occur until the Governor has first lifted the mandatory evacuation order for the Beaufort County barrier islands AND the Emergency Room at the Hilton Head Hospital is open and operational. There are also other critical deciding factors to include: inspection of the bridges and the causeway by the SCDOT, adequate provision of power, water and sewer utilities as determined by the Emergency Operations Center Team in coordination with the PSD’s, advance teams’ inspections of critical infrastructure facilities, including the Hilton Head Hospital, seven Fire Stations, critical storm water facilities including pump stations and major arterials. This comprehensive process is outlined in our Disaster Recovery Plan. *Re-entry is a prescribed process. There are defined groups and priorities, each color-coded. Please note, there is no specific category for business owners and operators. Some business owners are in possession of a certain determination about re-entry privileges from the Secretary of State of South Carolina. This will not allow re-entry onto the barrier island of Hilton Head until such time as announced by the Mayor. Re-entry decisions for these individuals and the general public will be determined real-time based upon conditions. We understand the communities desire for information and we will do our best to communicate to you as accurately and effectively as possible while we work re-establish community services. At this time, there is no time frame estimated to reestablish these services, but we will keep you updated to the best of our abilities on the status of our services as they are restored. Our area remains under a mandatory hurricane evacuation order. Hurricane Irma has been downgraded to a tropical storm as of this morning, but continues to bring inclement weather to our area. Beaufort County is presently under a flash flood warning. 4-6 feet of storm surge inundation, 4-8 inches of rain are forecasted for our area. To view weather updates here. Public Service Districts (Water) -Services remain pressurized and energized at this time. Public Service Districts first responders remain at Opcon 1 (emergency operations). Assessments will be performed as Mother Nature allows. The advance team consisting of Sea Pines Security and CSA Maintenance staff has relocated to Bluffton, SC effective at 4:00 PM yesterday and will return to Sea Pines as soon as permitted by emergency officials. Due to the mandatory evacuation, Sea Pines Security is no longer manning the gates. To allow for emergency & medical personal vehicle access the gates of the Sea Pines community must remain open. Our security dispatch staff has evacuated to safety, the Sea Pines Security Dispatch line (843-671-7170) is now being forwarded to the CSA Hurricane Hotline (1-866-671-EVAC), a recorded message update will be played. Please contact the Beaufort County Emergency Management by calling 911, to report an emergency, if these services are still available. A mandatory curfew, per the The Beaufort County Sheriff’s Department is in place for Hilton Head Island, Daufuskie Island, Harbour Island, Fripp Island & Hunting Island from 7:00 PM-7:00 AM tonight and Monday night. Hilton Head Island Hospital’s Emergency Room has suspend services. The emergency rooms at the Beaufort Memorial Hospital and Coastal Carolina Medical Center remain open. CSA will continue to provide updates as they become available. Please stay safe. Hilton Head Island Fire Rescue has ceased emergency operations as of 9:00 a.m. 9/11/2017. This is Bret Martin, CSA President writing to you from the CSA Administration Building. Sea Pines is bracing for the potential impacts from Hurricane Irma. Our area remains under a mandatory hurricane evacuation order and is under a Tropical Storm Warning, a Storm Surge Warning and is also under a Hurricane Watch. To view weather updates here. It is NOT advised to stay behind in Sea Pines, however if you plan to stay behind you are asked to contact Sea Pines via email at dispatch@seapinessecurity.com" target="_blank" rel="noopener">dispatch@seapinessecurity.com, please include the names of all in your party, address and contact phone number. Weather conditions in our area are expected to decline beginning this afternoon through tomorrow night due to the storm. Below are some updates related to Sea Pines CSA services. All CSA events from now until 9/15/17 are cancelled. The Sea Pines ARB office and the CSA Administration offices are closed and will remain closed until further notice. The advance team consisting of Sea Pines Security and CSA Maintenance staff will relocate to Bluffton, SC effective at 4:00 PM and will return to Sea Pines as soon as permitted by emergency officials. Sea Pines gate pass sales have stopped as of 11:00 PM on 9/8/17. Our security dispatch staff has evacuated to safety, the Sea Pines Security Dispatch line (843-671-7170) is now being forwarded to the CSA Hurricane Hotline (1-866-671-EVAC), a recorded message update will be played. Please contact the Beaufort County Emergency Management by calling 911, to report an emergency. CSA will continue to provide updates as they become available. At 3:30 PM today Sheriff P.J. Tanner will hold a press conference to provide on update on Hurricane Irma. Click here (https://www.youtube.com/channel/UCeFvudNHgf7avPwlpqvu6FA) to view a link to the press conference once it is made live at 3:30 PM. The Beaufort County Sheriff’s Department has issued a mandatory curfew for the following Beaufort County barrier islands: Hilton Head Island, Daufuskie Island, Harbour Island, Fripp Island & Hunting Island from 7:00 PM-7:00 AM Saturday, Sunday and Monday. Tolls for the Cross Island are open and the toll fees have been lifted during the evacuation. Road blocks are in place and residents and guests will no longer be able to enter or re-enter Hilton Head Island until the evacuation order is lifted. The Red Cross will have two shelters available within Beaufort County for those evacuating the barrier islands. Those shelters are open at this time and located at Bluffton High School located at 12 H. E. McCracken Drive in Bluffton and Battery Creek High School located at 1 Blue Dolphin Drive in Burton. The Red Cross has a shelter open in Jasper County located at Ridgeland-Hardeeville High School (250 Jaguar Trail, Ridgeland). adequate provision of power, water and sewer utilities as determined by the Emergency Operations Center Team in coordination with the PSD’s, advance teams’ inspections of critical infrastructure facilities, including the Hilton Head Hospital, seven Fire Stations, critical storm water facilities including pump stations and major arterials. This comprehensive process is outlined in our Disaster Recovery Plan. The Beaufort County Sheriff’s Department has issued a mandatory curfew for the following Beaufort County barrier islands: Hilton Head Island, Daufuskie Island, Harbour Island, Fripp Island & Hunting Island from 7:00 PM-7:00 AM tonight, Sunday and Monday. Mandatory curfew is in effect for Sea Pines. View the Sheriff’s Press Conference from 6:30 PM by clicking here. Sea Pines Property owners are advised to leave Sea Pines NOW. It is NOT advised to stay behind in Sea Pines, however if you plan to stay behind you must contact Sea Pines CSA Security Dispatch office at 843-671-7170 (phone line available until 10 PM tonight) or by email at dispatch@seapinessecurity.com" target="_blank" rel="noopener">dispatch@seapinessecurity.com, please include the names of all in your party, address and contact phone number. Once the mandatory evacuation is completed, emergency services, including Sea Pines Security and Beaufort County will NOT respond to emergency calls. Please do NOT leave your pets behind. Beaufort County is under a Hurricane Watch and Storm Surge Watch. To view weather updates here. Hilton Head Island Hospital’s Emergency Room will suspend services today (Saturday) at 4 p.m. The emergency rooms at the Beaufort Memorial Hospital and Coastal Carolina Medical Center plan to remain open. Evacuation by all Hilton Head Island citizens is essential, considering the threat of flooding, storm surge (potentially 4-6ft) and possible sustained hurricane strength winds. Following conference calls with state officials and the National Weather Service this afternoon, Sheriff P.J. Tanner will hold a press conference to address the public at 6:30 PM this evening. The press conference will broadcast live on the Beaufort County Sheriff’s Office website and the County Channel’s YouTube page. Hilton Head Island public schools will be closed on Monday and Tuesday. As of 10 a.m. this morning road blocks are in place and residents and guests will no longer be able to enter or re-enter Hilton Head Island until the evacuation order is lifted. The Red Cross will have two shelters available within Beaufort County for those evacuating the barrier islands. Those shelters will be: Bluffton High School located at 12 H. E. McCracken Drive in Bluffton and Battery Creek High School located at 1 Blue Dolphin Drive in Burton. The Red Cross storm shelters will be open Sunday Morning at 9:00 AM. The Red Cross will have a shelter open in Jasper County at 10:00 AM this morning, this shelter is located at Ridgeland-Hardeeville High School (250 Jaguar Trail, Ridgeland). Evacuation/Transportation (bus) schedules are available here. Palmetto Breeze will be providing bus services to Beaufort County evacuees needing transportation from the following locations until 6:00 PM today and resume tomorrow (Sunday) morning at 8:00 AM and continue until weather conditions are deemed unsafe: Port Royal Plaza (BI-LO/former Sam’s Club) on Hilton Head Island & Wal-Mart on Lady’s Island in the Beaufort area. Contact the Palmetto Breeze Evacuation Hotline 843-757-5782 for additional information. Effective Thursday 9/7/17 at 4:30 PM: Until further notice, all CSA events for the remainder of this week as well as those scheduled next week 9/11-9/15/17 are cancelled. The Sea Pines ARB office is closed and will remain closed until further notice. Effective Friday 9/8/17 at 12:00 Noon: The CSA Administration office is closed and will remain closed until further notice. Effective Today Saturday 9/9/17 at 10:00 PM- The Sea Pines Security Dispatch line (843-671-7170) will stop taking calls as our dispatch staff must be evacuated. At 10 PM tonight (9/9/17) our security dispatch line phone number will be forwarded to the CSA Hurricane Hotline (1-866-671-EVAC), a recorded message update will be played. Sea Pines Security and CSA Maintenance staff advance team currently remain on site in Sea Pines with a very limited crew to assist with evacuation efforts. We will notify the community when our staff must leave Sea Pines in order to safely evacuate. Our advance team will relocate to Bluffton and will return to Sea Pines as soon as permitted. South Carolina Governor Henry McMaster has issued a mandatory evacuation order of the following Beaufort County barrier islands: Hilton Head Island, Daufuskie Island, Harbour Island, Fripp Island & Hunting Island. Sea Pines is also included in this mandatory evacuation order which is currently in effect as of 10:00 AM today (Saturday September 9th, 2017) .Click here to view the Governor’s press conference from 7:45 PM yesterday. Sea Pines Property owners are highly encouraged to evacuate as soon as possible as traffic delays could occur and should be expected. It is NOT advised to stay behind in Sea Pines, however if you plan to stay behind you mustcontact Sea Pines CSA Security Dispatch office at 843-671-7170 or by email at dispatch@seapinessecurity.com" target="_blank" rel="noopener">dispatch@seapinessecurity.com, please include the names of all in your party, address and contact phone number. BE ADVISED- Once the mandatory evacuation is completed, emergency services, including Sea Pines Security and Beaufort County will NOT respond to emergency calls. tight container. Please do NOT leave your pets behind. The Red Cross will have two shelters available within Beaufort County for those evacuating the barrier islands. Those shelters will be: Bluffton High School located at 12 H. E. McCracken Drive in Bluffton and Battery Creek High School located at 1 Blue Dolphin Drive in Burton. The Red Cross storm shelters will be open Sunday Morning at 9:00 AM. The Red Cross will have a shelter open in Jasper County at 10:00 AM this morning, this shelter is located at Ridgeland-Hardeeville High School (250 Jaguar Trail, Ridgeland). The Sea Pines Security Dispatch line (843-671-7170) is still taking calls at this time. We will update you when the dispatch line will no longer be in service due to the evacuation. When this occurs the dispatch line phone number will be forwarded to the CSA Hurricane Hotline (1-866-671-EVAC), a recorded message update will be played. Since this mandatory evacuation includes Hilton Head Island, Sea Pines is also included in this mandatory evacuation order which begins effective 10:00 AM tomorrow (Saturday September 9th, 2017) .Click here to view the Governor’s press conference from 7:45 PM today. Sea Pines Property owners are highly encouraged to evacuate prior to 10:00 AM on Saturday September 9th, 2017 as traffic delays could occur and should be expected. Property Owners are encouraged to prepare their homes prior to evacuation: secure all outdoor items including furniture, decorations, and flags, close and lock doors and windows, return trash cans to proper holding place or secure inside, bring copies of important documents in a water tight container. Please do NOT leave your pets behind. Effective Yesterday (Thursday 9/7/17) at 4:30 PM: Until further notice, all CSA events for the remainder of this week as well as those scheduled next week 9/11-9/15/17 are cancelled. The Sea Pines ARB office is closed and will remain closed until further notice. Effective Today (Friday 9/8/17) at 12:00 Noon: The CSA Administration office is closed and will remain closed until further notice. South Carolina Governor Henry McMaster is expected to hold a second press conference today, September 8th, after receiving the 5 p.m. National Weather Report update on Hurricane Irma. The press conference will be live from the South Carolina Emergency Management Division (SCEMD). lo view the live press conference. South Carolina Governor Henry McMaster will hold a press conference at 2:00 p.m., September 8th, regarding an update on Hurricane Irma and it’s potential impacts to South Carolina. Visit https://www.scetv.org/ to view the live press conference once it begins at 2PM. Irma is a potentially catastrophic Category 4 hurricane and will continue to bring life-threatening wind, storm surge, and rainfall hazards to the the Turks and Caicos and the Bahamas through Saturday. Heavy rainfall is still possible across portions of Hispaniola through today. Hurricane conditions will also spread over portions of the north coast of Cuba, espeically over the adjacent Cuban Keys through Saturday. Severe hurricane conditions are expected over portions of the Florida penisula and the Florida Keys beginning Saturday night. Irma is likely to make landfall in southern Florida as a dangerous major hurricane, and bring life-threatening storm surge and wind impacts to much of state. A Hurricane Warning is in effect for souther Florida, the Florida Keys, Lake Okeechobee, and Florida Bay, while Hurricane Watches have been issued northward into central Florida. A Storm Surge Warning is in effect for southern Florida and the Florida Keys. A Storm Surge Warning means there is a danger of life-threatening inundation, from rising water moving inland from the coastline, during the next 36 hours. This is a life-threatening situation. Persons located within these areas should take all necessary action to protect life and property from rising water and the potential for other for other dangerous conditions. Promptly follow evacuation and other instructions from local officials. A Storm Surge Watch has been issued north of the Storm Surge Warning area for portions of the central Florida coast. There is a chance of direct impacts in portions of Georgia, South Carolina, and North Carolina, but it is too early to specify the magnitude and location of these impacts. Hurricane Irma is expected to impact our area beginning Sunday. South Carolina Governor Henry McMaster is excepted to issue a mandatory evacuation of Beaufort County (to include Hilton Head Island and Sea Pines) beginning at 10:00 AM on Saturday September 9th, 2017.Click here to view that press conference from 2:00 PM today. It is NOT advised to stay behind in Sea Pines, however if you plan to stay behind you mustcontact Sea Pines CSA Security Dispatch office at 843-671-7170 or by email at dispatch@seapinessecurity.com" target="_blank" rel="noopener">dispatch@seapinessecurity.com, please include the names of all in your party, address and contact phone number. BE ADVISED- Emergency services, including Sea Pines Security and Beaufort County will NOT respond to emergency calls once the evacuation is completed. Property Owners are encouraged to prepare their homes prior to evacuation: secure all outdoor items including furniture, decorations, and flags, close and lock doors and windows, return trash cans to proper holding place or secure inside, bring copies of important documents in a water tight container. Effective 4:30 PM Today (Thursday 9/7/17) Until further notice, all CSA events for the remainder of this week as well as those scheduled next week 9/11-9/15/17 are cancelled. The Sea Pines ARB office are closed and will remain closed until further notice. Effective 12:00 Noon Tomorrow (Friday 9/8/17) The CSA Administration office will close and will remain closed until further notice. Sea Pines Security, Dispatch & Maintenance we still on site making preparations for the Hurricane. Notice will be sent out when final CSA staff members leave Sea Pines for the evacuation. Effective 10:00 AM on Saturday 9/9/17: Sea Pines Security will begin moving through the Sea Pines community utilizing their patrol cars PA systems to notify the community of the official evacuation order, advising citizens to evacuate immediately. The Sea Pines Security Dispatch line (843-671-7170) is still taking calls at this time. We will update you when the dispatch line will no longer be in service due to the evacuation. When this occurs the dispatch line phone number will be forwarded to the CSA Hurricane Hotline (1-866-671-EVAC), a recorded message update will be played. Please be patient with all emergency services, their website and providers. If numbers or websites are busy, please try back again. Please note- Communications from CSA should be secondary to the messages passed from government officials via local TV, radio and emergency management websites. As of this morning Hurricane Irma remains a powerful category 5 storm over the Atlantic Ocean. No evacuation order for Beaufort County has been issued as of yet. Emergency Management officials continue to closely monitor Hurricane Irma. 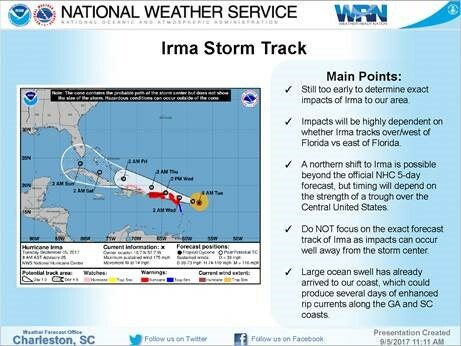 Beaufort County residents and guests are urged to plan ahead and stay up-to-date with developments on Hurricane Irma through the National Weather Service (NWS) Charleston http://www.weather.gov/chs/. The NWS provides updates at 2:00 am, 5:00 am, 8:00 am, 11:00 am, 2:00 pm, 5:00 pm, 8:00 pm and 11:00 pm. South Carolina Gov. Henry McMaster declared a State of Emergency yesterday, allowing for state agencies to coordinate efforts if a weather emergency arises. Click here to watch his press conference from yesterday. While the path of Hurricane Irma will be more clear over coming days, we encourage you to prepare your homes and businesses for the possibility of evacuation. Below are resources you can use to stay informed. As of 1100 AM, the eye of Hurricane Irma was located near latitude 16.8 North, longitude 58.4 West. Irma is moving toward the west near 14 mph, and this general motion is expected to continue today, followed by a turn toward the west-northwest tonight. 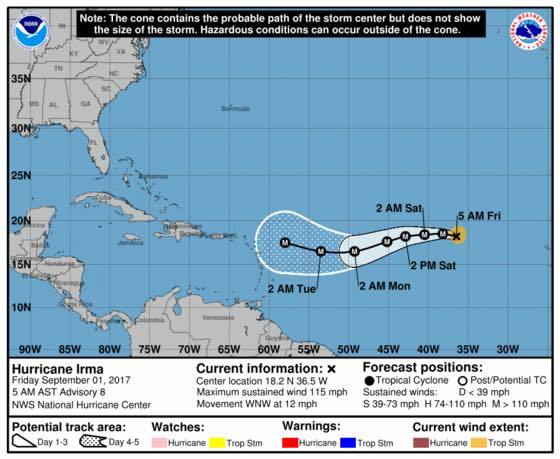 On the forecast track, the extremely dangerous core of Irma is forecast to move over portions of the northern Leeward Islands tonight and early Wednesday. Reports from an Air Force Hurricane Hunter aircraft indicate that the maximum sustained winds are near 180 mph with higher gusts. Irma is an extremely dangerous category 5 hurricane on the Saffir-Simpson Hurricane Wind Scale. Some fluctuations in intensity are likely during the next day or two, but Irma is forecast to remain a powerful category 4 or 5 hurricane during the next couple of days. Hurricane-force winds extend outward up to 60 miles from the center and tropical-storm-force winds extend outward up to 160 miles. Please make sure you have your hurricane plan in place. Review the Citizens Guide to Emergency Preparedness (English or Spanish) by clicking here. Sign up for Emergency Alerts from the Town of Hilton Head by clicking here. We will continue to monitor the storm and provide additional information as they become available. Please be advised, Hurricane Irma currently has sustained winds of 115 mph and is located 2,850 miles ESE of Charleston. Currently there are no coastal watches or warnings in effect for our area. However, property owners are asked to keep a close eye on weather conditions as they can change quickly. Visit http://www.nhc.noaa.gov for updates.